Ravenna is, today, a relatively quiet provincial spot, just a bit too big to be called a town but a bit too small to be called a city. Its laid-back atmosphere and understated elegance belies Ravenna's historical importance, as its strategic location near the Adriatic on Italy's eastern shore (just two hours south of Venice in contemporary Emilia-Romagna) made the city a perfect choice as seat of power for a number of successive empires. Though everyone from the Ostrogoths to the Lombards have ruled from here over the centuries (if not millenia), the reign which left the biggest mark was doubtless that of the Byzantine Emporer Justinian I, who as an orthodox Christian opposed the Ostrogoth and Arian Christian rule and, in 540, conquered Ravenna and made the city the seat of his Byzantine rule in Italy. 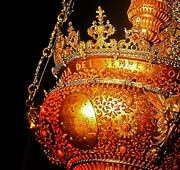 During the next fifty years, Ravenna's most famous monuments were constructed, including churches, baptistries, and mausolea. Though many count as some of the oldest surviving Christian structures in Italy, it is not the buildings themselves that travelers flock to visit, but the vast, glittering mosaics decorating their internal walls, apses, and domes. Ravenna is home to some of the world's most dazzling Byzantine mosaics (older and more intact than even those in Turkey), which are precious not only for their workmanship and excellent state of preservation, but also as an important example of a critical moment in art history bridging the gap between ancient Roman art and early Christian Byzantine art. Roman mosaics are marked by a natural style, were made primarily from clay or marble tesserae to decorate the floors of public and private spaces, and are dominated by depictions of animal sacrifices, domestic scenes or geometric patterns. 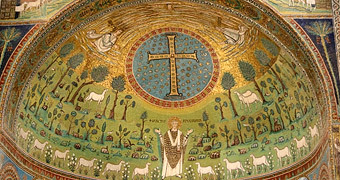 The later Byzantine mosaics use glass tesserae called smalti, often backed with gold or silver leaf, and decorate the walls and ceilings of religious buildings with ethereal Christian imagery, marked by dramatically shining halos and shimmering skin accomplished with the masterful use of gold leaf and angled smalti. 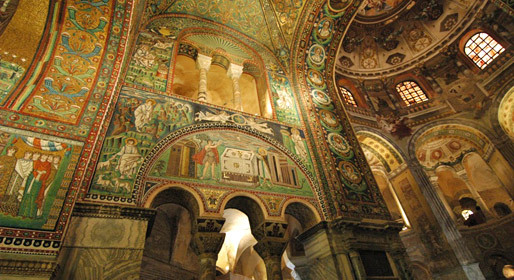 Though Venice's San Marco is an example of the height of Byzantine mosaic art, Ravenna is a no less important example of its evolution and mastery, and travellers to Italy shouldn't miss this chance to gaze upward, mouths gaping and eyes shining, at these masterpieces which have survived intact the past 1,500 years. 'Basilica di San Vitale:' This 6th century octogonal basilica holds Ravenna's most famous mosaics, which cover the choir and apse with glittering depictions of flora and fauna, scenes from the Old Testament, Byzantine rulers, and Christ with saints. 'Basilica di Sant'Apollinare Nuovo:' The mosaic cycles here date from both this church's Arian origins and its later Byzantine consecration under Justinian, and are an example of the earlier Western and later Eastern styles. 'Chapel of Sant'Andrea:' The smallest of Ravenna's mosaic sites, this private chapel built around the year 500 is ornately decorated with mosaic flowers, Christ figures, and, famously, almost 100 species of birds. 'Basilica of Sant'Appolinare in Classe:' Located outside the center of Ravenna near the ancient Roman port of Classe, this church is one of Ravenna's eight UNESCO World Heritage Sites, primarily for the lavish mosaics which decorate the apse. 'Battistero degli Ariani:' One of the few remaining monuments of the proto-Christian Arian cult, which was opposed and suppressed by Justinian, this baptistry boasts dazzling mosaics depicting the baptism of Christ and the apostles covering the inside of the dome. 'Battistero Neoniano:' The oldest of Ravenna's monuments, this baptistry dates from the late fourth to the early fifth centuries and was built on the site of an ancient Roman bath, the marble inlay work of which is still visible beneath the glorious mosaics decorating the dome. 'Mausoleo di Galla Placidia:' Galla Placidia is one of the most fascinating female figures in late Roman history. Born a princess, she was daughter, sister, wife, and mother of Roman emporers during the course of her life. She commissioned this tomb in the 5th century, which has a simple exterior and sumptuous interior mosaics (some of the oldest in the city). 'Mausoleo di Teodorico:' Though this is one of Ravenna's few monuments lacking mosaics, the stone tomb of Teodorico, king of the Ostrogoths, dates from the year 520 and is decorated with beautiful friezes.